Racing cylinder kit from Polini for 50cc Minarelli hor. AC, cast iron, with 2 piston rings, pin 10 mm, cylinder head Ø 40,0mm, 8.500-9.500 rpms. 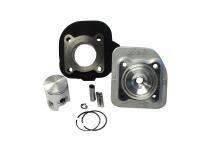 The racing cylinder kit 50cc is a perfect allround cylinder kit. Nice workmanship, huge port areas and a high quality finish mark this cylinder kit standing out from the crowd. You can use it plug & play (the only necessary modification then is to fit a bigger main jet or you can tune it further. With every other modification like bigger carbs or different kind of exhausts the power increases further. The racing cylinder is a good starting point to built anything from a decent tourer to a nice street racer. Either way you will be very pleased by the power delivery.